An immense construction crane will lift the first wall of the new Austin High School into place on Monday, marking a significant development for the 2012 Bond project. The news was announced to the school’s Project Advisory Team on Wednesday during its regular meeting, which also included general construction and budget updates. The $80.9 million project, which is scheduled to be completed in 2020, will feature modern classrooms and flexible learning spaces while also preserving the historic front facade of the original main building, which opened in 1937. This entry was posted in 2012 bond, 21st century schools, Business Operations, Green Schools, High Schools, HISD: Our Story, New schools, News and tagged 2012 bond, 2012bond, Austin High School, Austin HS, Build HISD, BuildHISD, Building Excellence on January 17, 2019 by HISD Communications. Condit Elementary School has received the Leadership in Energy and Environmental Design (LEED) Silver certification for its new building, which was constructed as part of HISD’s 2012 Bond Program. Developed by the U.S. Green Building Council, LEED certification provides independent verification of a building’s green features and is the most widely used green building rating system in the world. Green schools offer improved air quality, lighting, temperature control, and acoustics, as well as reduced operating costs — all of which enhance the overall learning environment and have been shown to boost student health, test scores, and faculty retention. This entry was posted in 2012 bond, Business Operations, District V - Sue Deigaard, Green Schools and tagged 2012 bond, Condit ES on July 10, 2018 by HISD Communications. A sea of red flooded the main entrance of Furr High School on Friday morning as the cheerleaders, Sparkle Dancers — dressed in red and white uniforms — and band pepped up the crowd in celebration of the school’s building dedication ceremony. Music and chants echoed through the air, and lush trees and landscaping lined the length of the brightly colored 182,000-square-foot-building, offering an ornate backdrop to a long red ribbon stretched across the building’s main walkway. This entry was posted in 2012 bond, 21st century schools, Career/technical education (CTE), District VIII - Diana Dávila, Fine arts, Futures Academy, Green Building, Green Schools, High Schools, New schools, News and tagged 2012 bond, 2012bond, bond 2012, Build HISD, BuildHISD, Diana Davila, Furr, Furr High School, Furr HS, green building, Green Schools, high school, high school rebuilds, new school, new schools, STEM on May 18, 2018 by HISD Communications. 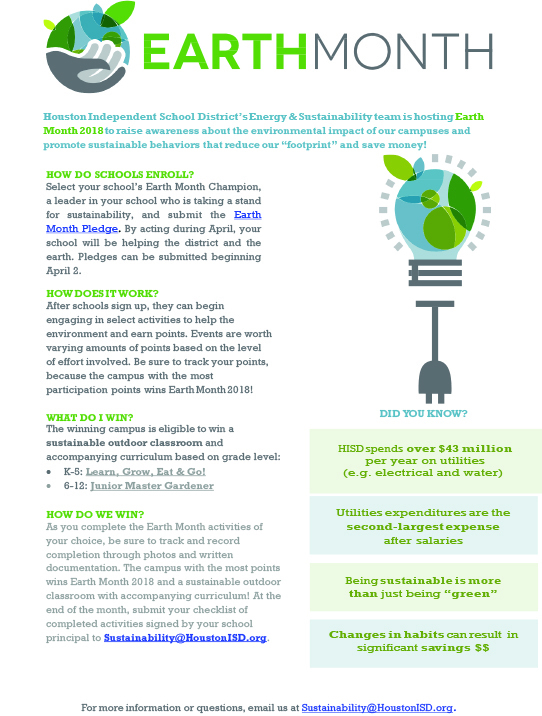 The Houston Independent School District’s Energy and Sustainability Department is celebrating Earth Day throughout the month of April. All HISD campuses are invited to participate in the department’s “Earth Month” campaign, which aims to raise awareness and educate the community about the impact humans have on the environment and promote sustainable actions that help schools reduce their carbon footprints. This entry was posted in Green Schools, HISD: Our Story, News and tagged Earth Day, Earth Month, Energy and Sustainability, Recycle on April 5, 2018 by HISD Communications. Milby High School has achieved Leadership in Energy and Environmental Design (LEED) Silver certification for its new building, which was constructed as part of HISD’s 2012 Bond Program. This entry was posted in 2012 bond, 21st century schools, District III - Sergio Lira, Green Building, Green Schools, High Schools, HISD: Our Story and tagged 2012 bond, Green Schools, Milby HS on February 2, 2018 by HISD Communications. Representatives from the National Wildlife Federation visited Piney Point Elementary School this morning to present the campus with the Eco-Schools USA Green Flag Award. The Green Flag is the highest honor a school can receive from the NWF. Piney Point is only one of two schools in Houston to be recognized this year and one of three elementary schools in the state of Texas to receive the honor. “Here at Piney Point, we truly live by our motto – Everyone Learning, Everyone Leading,” Principal Bobby Swaby said. This entry was posted in Achievement/Recognition, District VI - Holly Maria Flynn Vilaseca, Elementary Schools, Global Education, Green Building, Green Schools, New schools, News and tagged 2007 bond, 2007 bond program, Eco-Schools, Energy & Sustainability, green building, Green Schools, National Wildlife Federation, Piney Point ES, sustainability on October 6, 2017 by HISD Communications. HISD’s Energy & Sustainability Department has announced Lantrip Elementary School as the winner of the Earth Month 2017 contest. The annual Earth Month contest encourages schools to participate throughout the month of April in a variety of environmentally friendly activities in exchange for participation points. The group with the largest amount of participation points wins the grand prize – an outdoor classroom. The contest aims to raise awareness about the environmental impact of HISD campuses and promote sustainable behaviors and actions that can reduce carbon footprints. This entry was posted in Achievement/Recognition, Elementary Schools, Green Schools, Magnet/School Choice, News, Science and tagged Diana Davila, Earth Day, Energy & Sustainability, lantrip elementary school on May 30, 2017 by HISD Communications. Students and staff at Atherton Elementary are excited about the newest addition to their campus – a rooftop garden. And they have big plans for it. “We can learn how plants grow and change over time,” said fifth-grader Nathaniel Alvarenga. This entry was posted in District II - Rhonda Skillern Jones, Green Schools, Science and tagged Atherton ES on April 20, 2017 by HISD Communications. Houston Independent School District Chief Operating Officer Brian Busby pledged more outreach and assistance to small business owners seeking to do business with the district in his first public appearance since being named to lead the district’s business operations division and its 7,000 employees. This entry was posted in 2012 bond, 21st century schools, Food Services, Green Building, Green Schools, New schools, News, Nutrition Services and tagged 2012 bond, Brian Busby, Chief Operating Officer, COO, Greater Houston Black Chamber, operations on December 16, 2016 by HISD Communications. The groundbreaking ceremony for the new addition and renovations at Wilson Montessori School on Tuesday had all the usual celebratory elements from the obligatory shovels and hard hats to a distinguished list of speakers. But Principal Beth Bonnette turned the morning into a teachable moment for the school’s more than 500 students when she challenged them to be part of history by contributing to a time capsule that will be placed within the walls of the new building. This entry was posted in 2012 bond, 21st century schools, District VII - Anne Sung, Elementary Schools, Green Building, Green Schools, Magnet/School Choice, New schools, News and tagged 2012 bond, wilson montessori on November 15, 2016 by HISD Communications.